WordPress is undoubtedly the most popular CMS platform used by the most successful websites today. WordPress is a prosperous framework because it is contributed by a large community of WordPress lovers around the globe. So, there are a plenty of elegant WordPress products available with thousands of freebies too. The free responsive WordPress themes are as rewarding as the premium ones with lots of incredible, promising features & ever so strong security…. If you have a plan to create a new website or redesign your existing one, you probably opt for WordPress platform because it’s easy to use, open source and most flexible framework. In the crowd of thousands of free themes in the web, some are really awesome whereas some are just like freebies. Here are 50+ best free WordPress responsive themes for 2018 for your convenience. The themes are listed considering total downloads from official WordPress theme directory at WordPress.org, user ratings, usability, design etc. 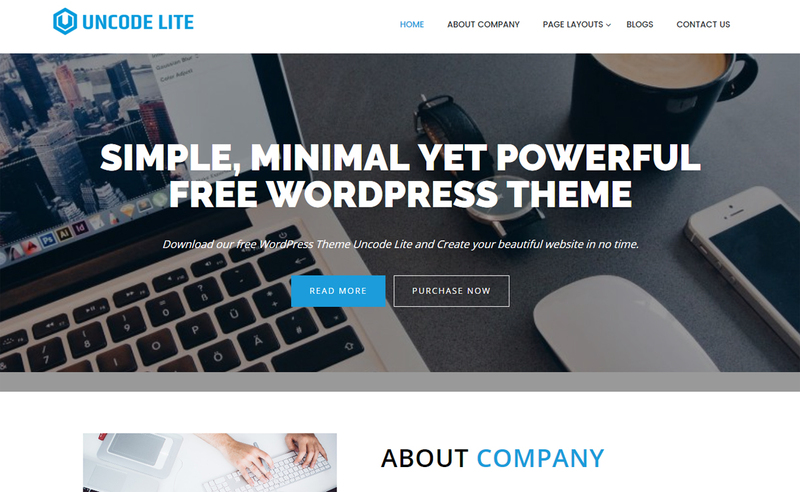 Agency Lite is a responsive and multipurpose WordPress theme that has all the right features for any business, corporate, agency, blog and portfolio website. You can find multiple well crafted and well coded sections with this theme, all of which can be enabled and disabled as per your convenience. Not just this much, Agency Lite is a theme that can be highly configured, that too with live preview. And you will have the best time creating your website with the top-notch documentation and support that comes along with the theme. Parallax is a new trend in WordPress community used to make the websites more engaging and effective. 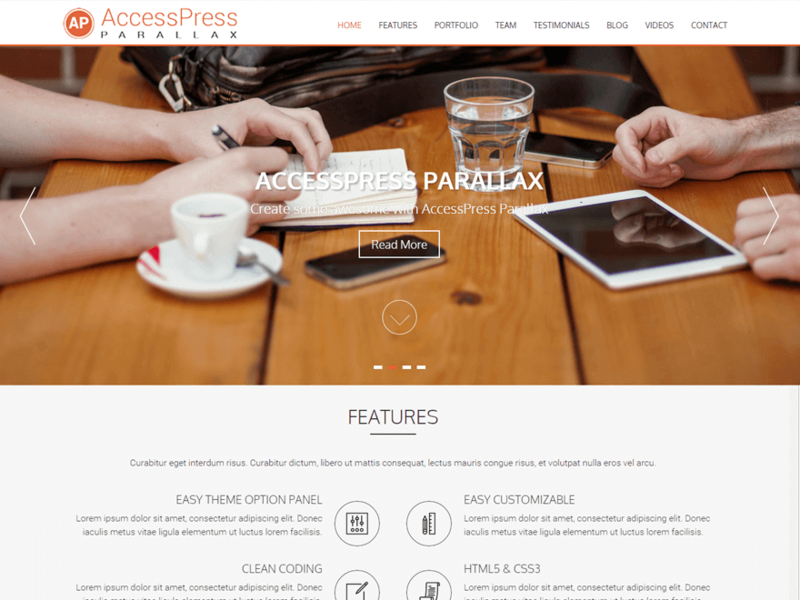 Accesspress Parallax is a beautiful WordPress theme using Parallax effect in Access Keys. It has and theme option panel, featured slider, advanced post settings, multiple site layouts and many more. It is 100% responsive and SEO friendly. The theme is worth a watch for your next project! This is a very simple and clean theme, loaded with features. You can have a live preview of every small/big change you go on making across your customization process. This theme even allows you to configure your breadcrumbs settings, navigate your important pages and post in homepage. It has a fully built Customizer which means each and every aspect of your website can be tailored as per your preference. This theme being very minimal has amazing loading speed. Translation of languages, advanced footer social icons link, custom CSS section and many other settings definitely makes this theme worth its while. FortySeven Street is a very elegant theme designed for anyone who enjoys powerful functionalities and sophistication. This theme has extensive customization settings, so it allows you to set the appearance of the page exactly as you desire. It facilitates the needs of travelers, corporate houses, photographers, nature lovers, bloggers ,etc. The best part about this theme is it’s compatible across all browsers. In here, you can choose from various header slides; enable/disable sections of homepage; keep your menus always sticked at the top; showcase your sponsors, statistics, portfolios, testimonials, pricing tables and so much more. Not only is this theme super responsive but also comes up with great customer care support. Gaga Lite is creative, free one page WordPress theme with a modern and trendy design. It is a feature-rich theme that can be used for multiple purposes – it is suitable for photography, business, portfolio or any other websites. You can configure it’s all aspects along with live preview, using its easy live customizer tool. It includes multiple header layout, full screen slider, team section, services section, portfolio layout, blog layout many more. Its full control and management is in your hand, you can personalize your website in your own way. MH Magazine Lite is an awesome free magazine-style WordPress theme. This feature-rich responsive theme is an ideal choice for creating a perfect online magazines, newspapers and journal websites. It comes with altogether 12 widget areas where you can add WP widgets, custom widgets, and ads and enhance your website functionality as per your need. The theme is simple and user-friendly, that includes easy to use theme options and good documentation. AccessPress Store is feature-rich free WordPress eCommerce theme with best ever WooCommerce plugin integration. It is carefully crafted focusing design, features and usability for creating a perfect online shop instantly. It is a fully responsive theme with lots of amazing customization options. It offers background configuration, color configuration, configurable homepage, multiple category display layout and many more. The theme is clean, simple, easy to use and SEO friendly. Customizr is a beautiful, fast and responsive theme by nikeo. It is highly customizable and multipurpose theme which can be used for creating different kinds of websites. The theme is lightweight and compatible with all the major browsers. The well documented and modular code offered by the theme make the work of the website developers easier. The theme is worth a watch for your next project! ScrollMe is a unique free horizontal scrolling WordPress theme that fits for photography, personal blog, portfolio, business and any other websites. ScrollMe is a modern theme that presents an inspirational horizontal scrolling experience – just very few clicking. 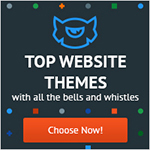 With this feature-rich theme, anybody can create a complete and beautiful website in no time. The theme comes with the full customization ability and multiple options to make your website the best one. It has got full screen slider, various sections at homepage, pricing plan tables etc. to showcase your content in an eye-catching way. Zerif Lite in a perfect multipurpose single page theme with parallax effect by CodeinWP. It is ideal for web agency business, corporate business, personal and parallax business portfolio, photography sites, and freelancer. It is clean, responsive, minimal and a modern theme which supports WooCommerce for eCommerce websites. The theme is SEO friendly, Retina Ready and supports full-screen background image. The theme is worth a watch for your next project! 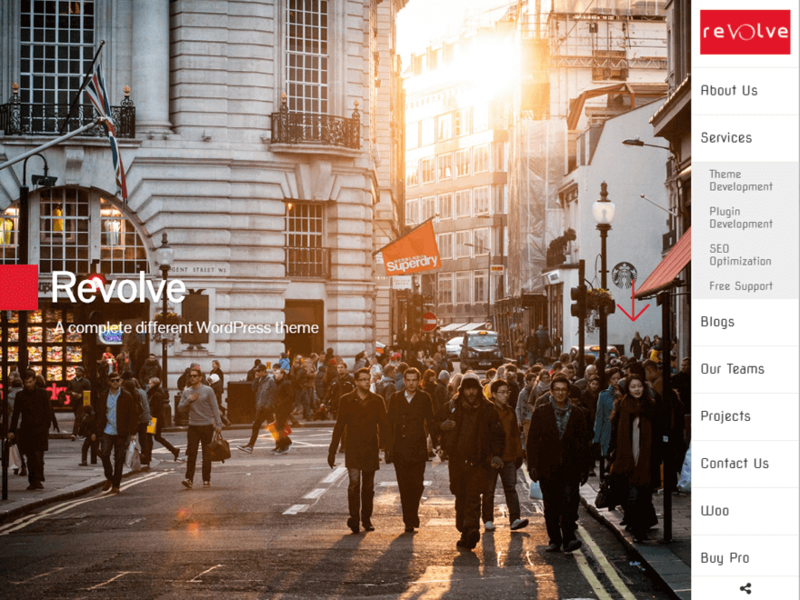 Revolve is an excellent vertical scrolling free WordPress multipurpose theme with a beautiful and user friendly design. Revolve is a unique and creative theme with fullscreen vertical slider and unique scroll – a theme with style. This fully responsive theme allows you to configure the whole theme completely using its cool customizer tool. Vertical scrolling effect is the key feature of this theme which makes your website eye pleasing and attractive. It follows the best SEO practices and is optimized for fast loading. You can transform it into any language – it is translation ready. 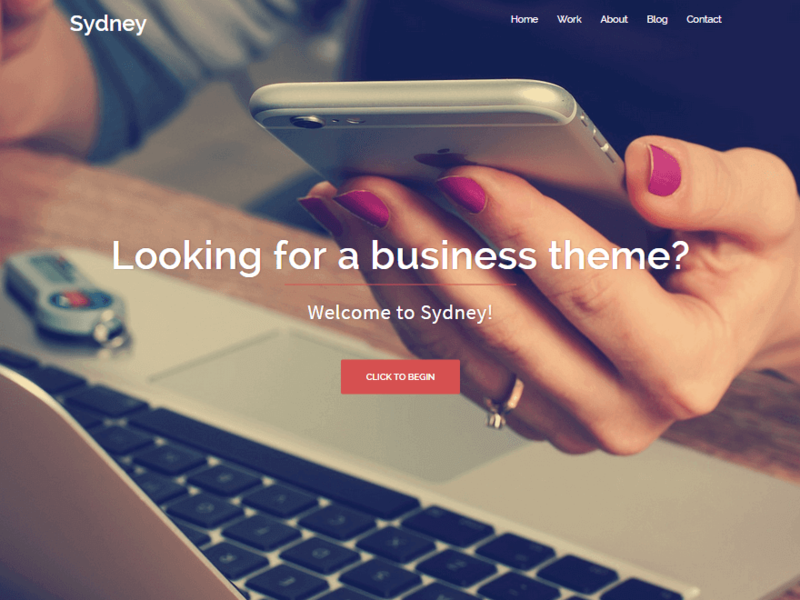 Sydney is a powerful responsive business theme by athemes. It gives an easy way to the companies or freelancers to create an awesome online presence by enabling you to create an engaging front page within minutes. It offers a plenty of customization options like access to all Google Fonts, full color control, layout control, logo upload, full screen slider, header image, sticky navigation and much more. The theme is worth a watch for your next project. AccessPress Lite is a responsive multipurpose WordPress theme by Access Keys. The theme is beautifully designed and clean which looks as professional as a premium theme. It offers multiple layouts such as events layout, testimonial layout, blog layout, gallery layout etc to make the user experience more beautiful than ever. The theme has a good social media integration, SEO support and cross-browsers compatibility. The theme is worth a watch for your next project! EightStore Lite is a feature-rich free WooCommerce WordPress theme with fully responsive layout. It comes with clean and beautiful design that is perfect for creating any kind of online stores. The theme has got highly configurable homepage, advanced wishlist, product slider, YouTube video integration on pop up banner and many more exciting features that are probably not available with other free themes. It is a SEO friendly theme with clean and simple typography options and is optimized for fast loading speed. 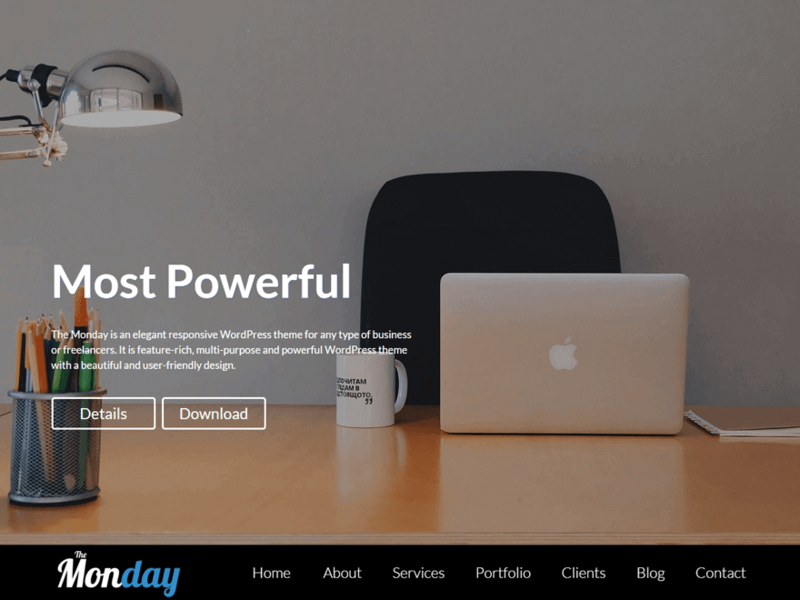 The Monday is an elegant free WordPress theme loaded with lots of modern features that makes our business website a perfect one. It is one page parallax theme with user friendly design ideal for any kind of business site – whether small business or large commercial business or nonprofit or entrepreneur. The theme has got amazing animation effect and awesome extensive homepage – which is the foremost thing that attracts your website visitors and converts them into your customers. StoreVilla is a creative free eCommerce WordPress theme, packed with plenty of exciting features. It is integrated with the best eCommerce platform i.e WooCommerce and its extensions. It comprises unlimited slider options, multiple category display layout, highly configurable homepage, 10+ widgets areas, 2 WooCommerce archive layouts etc. which you can use and manage on your own way. 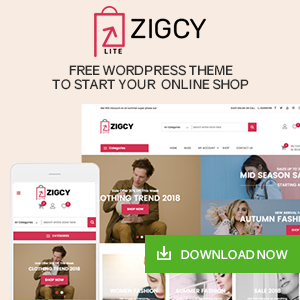 The Shop is easy to use free WordPress eCommerce theme perfect for creating any kind of online shop. This fully responsive theme is well compatible with the popular WooCommerce plugin. It is simple, clean and easy to use theme that offers custom front page, fonts and color options, a header slider, two menus etc. If you don’t like the available theme fonts, it provides you with easy access to more than 600 google fonts, you can choose any of your choice. It follows WordPress best practices and supports to all major browsers. 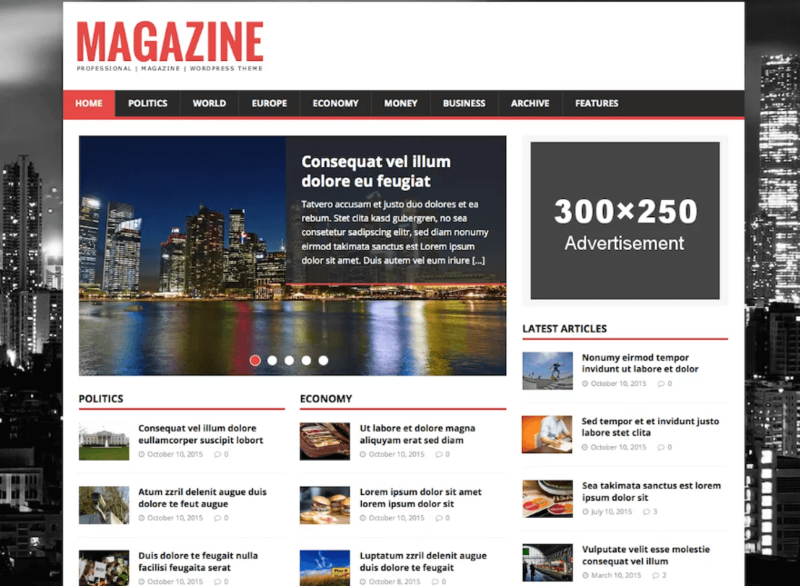 VMag is a beautiful free WordPress magazine template designed for online magazines, newspapers, journals, professional blogs and other reviews publishing websites. It is a super flexible theme with a clean and elegant design. It has got a beautiful slider section where you can display your important and latest content in an interesting way. It is the best choice for creating a perfect magazine website as it contains many powerful features like carousel news widgets, Ads section, news ticker, related articles in single page and so on. EightMedi Lite is a stunning free medical WordPress theme designed beautifully for doctors, surgeons, medical personnels, hospital, clinics, pharmacies, etc. It is well qualified with all essential features, flat design and awesome customization options. With this theme you can explore your creativity and create a complete and professional looking website within few minutes – you don’t need to have any coding knowledge. It is a fully responsive and user friendly theme. FotoGraphy is a fully flexible free WordPress photography theme for professional photographers, photo bloggers and photojournalists. It contains the latest trending features to let you create a complete and perfect website for uplifting your profession in higher level. It is a simple and clean theme that automatically adapts to all screen sizes and functions well on all devices ranging from desktop to mobile. It has got beautiful homepage with category based grouping of gallery, photos in grid format, multiple blog layout and many more. It is a perfect magazine theme by Access Keys. It can be used for creating newspaper, magazine, editorial, blog or personal websites. It has a wonderful social network integration and SEO optimization. The theme is beautifully crafted and allows a plenty of options for the theme customization. The theme is worth a watch for your next project! Spacious is an incredibly spacious WordPress theme by ThemeGrill. the theme is beautifully designed and multipurpose which can be used for business, portfolio, blogging or any type of site. It offers plenty of customization options including layout control, color options and font options. It is easy to use, lightweight and translation ready. The theme is worth a watch for your next project! One Paze is a free one page style WordPress theme with smooth parallax effect. This multipurpose theme is enriched with the powerful features that essential to create a complete website. It is fully based on cool Customizer tools, with which you can configure almost all the settings, design and sections easily and give a unique look to your website. It is a fully responsive, translation ready and SEO friendly theme that focus for a better user experience and usability. 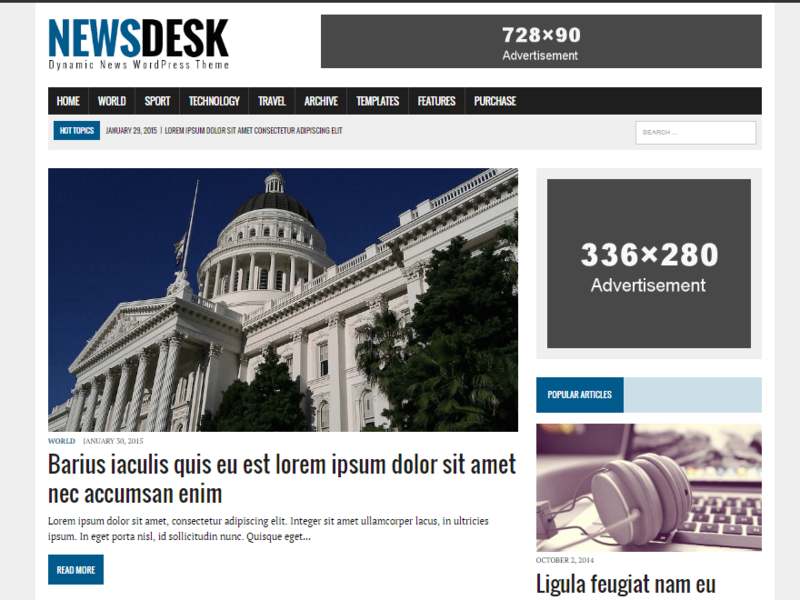 MH Newsdesk is a versatile free WordPress news-magazine theme with latest features and elegant designs. The theme is neatly coded and designed to be fully responsive for giving the best performance. It is completely based on WordPress theme Customizer that lets you change its elements along with the live preview. It is an SEO friendly and translation ready theme that supports all major browsers. 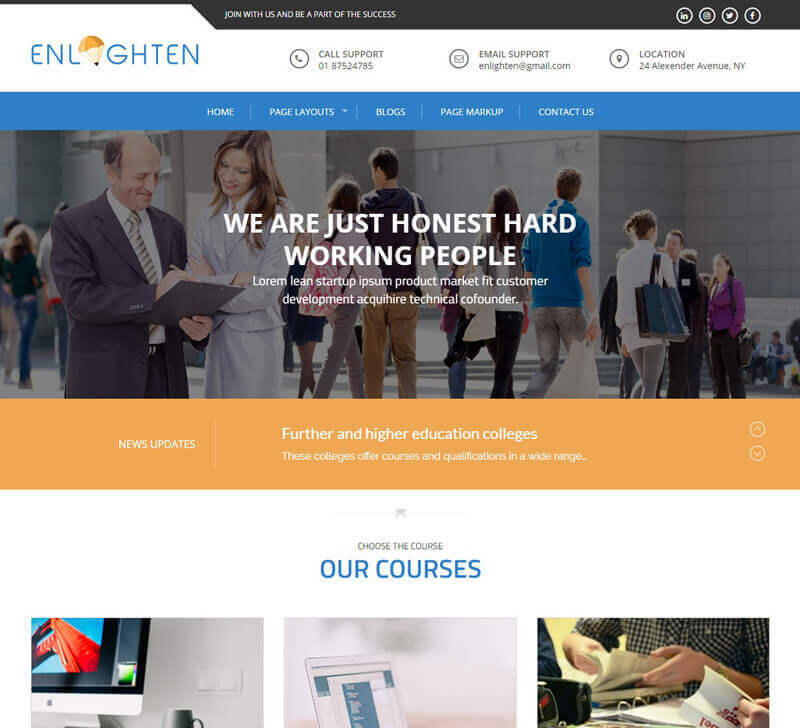 Enlighten is a fully responsive free WordPress education theme that is best suited for any academic or institutional websites. It comes with clean and elegant design including many useful sections like call to action, FAQ and testimonial, latest news, Twitter feed, message and many other. The theme is fully based on live Customizer that allows you to configure almost all the elements and live preview the changes instantly. 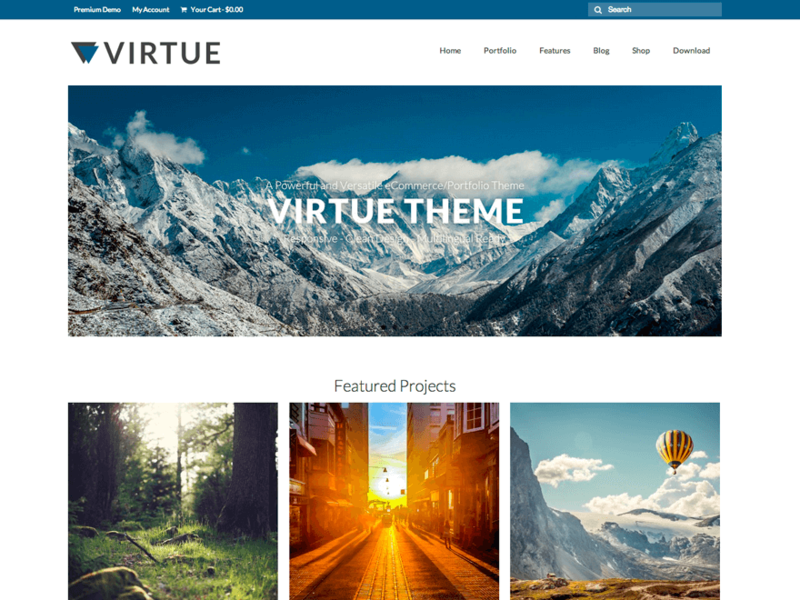 Virtue is a versatile WordPress theme with a lot of options and great features by Kadence Themes. It is ideal for any kind of ecommerce website/ online store, portfolio or personal site. 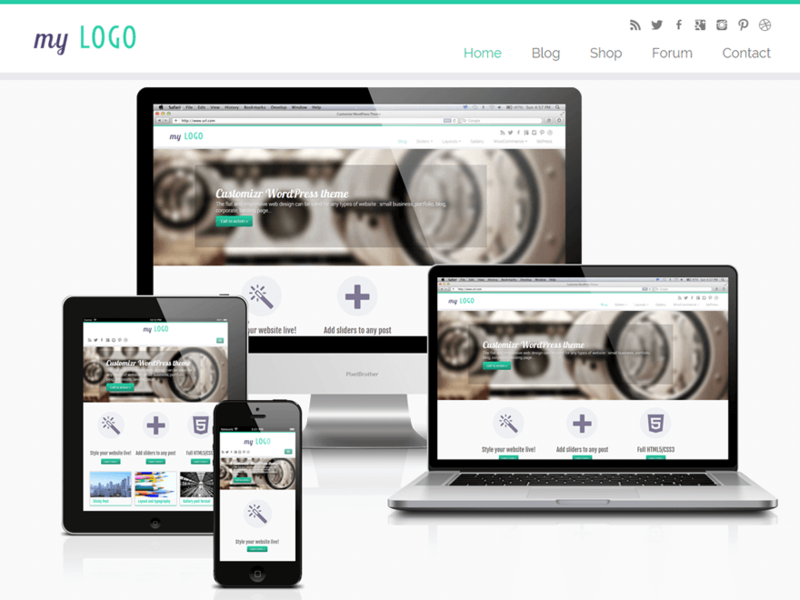 It is a fully responsive and mobile friendly framework built up with HTML5 and CSS3. You can completely customize the theme from the options panel and make your own website in the very short period of time. The theme is worth a watch for your next project! Bloger is a minimal free WordPress blog theme suitable for creating personal or professional blogs, organizational blog websites or news, magazine websites. It is a fully responsive theme that looks great on all devices and can be used via any available browsers. 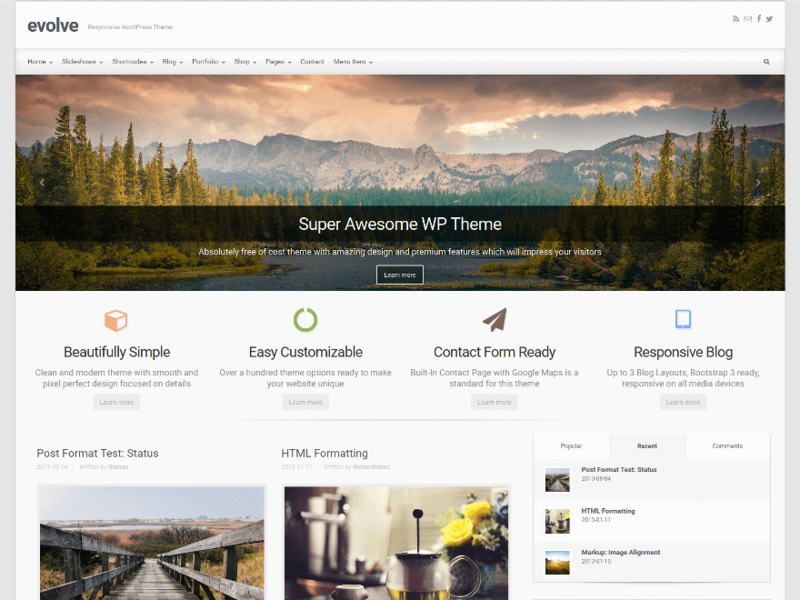 The theme is based on awesome WordPress Customizer – you can change settings, designs and other elements as per your requirement and it also lets you live preview the changes instantly to make your work easier. SKT Coffee is a professional free WordPress theme that looks great for café and restaurant websites. 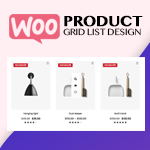 It is a Google mobile friendly theme, compatible with all major WordPress plugins like Nextgen Gallery, WooCommerce, Contact plugin and SEO plugins. It is coded with HTML5 and CSS3 which makes it simple, fast loading and easy to use. It is also integrated with social media icons to connect you directly with your visitors.it is provided with good documentation and dedicated support to help you in every step. 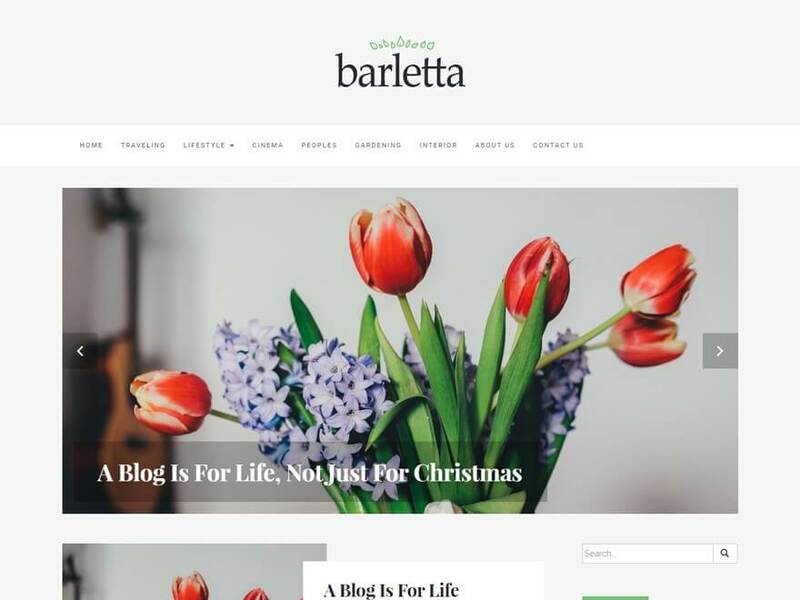 Barletta is a lightweight free WordPress blog theme well suited for lifestyle, travel, fashion, food, personal blog and so on. It is based on a popular Bootstrap framework which has made it a simple and user friendly theme. The theme is fully responsive that adapts well on all devices. It allows you to customize logo, background, slider and other features right from the customization panel. It is well compatible with major free and premium WordPress plugins like WooCommerce, Contact Form 7and many other. 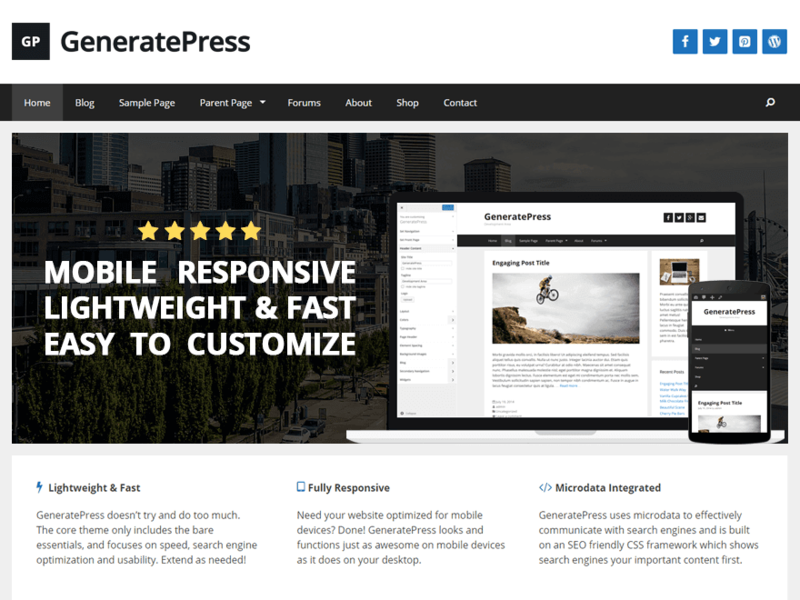 GeneratePress is a fast and lightweight responsive theme by Tom. It is built with speed, SEO and usability in mind. The theme is search engine friendly, cross-browser compatible, translation ready, WooCommerce and BuddyPress compatible to make the user experience better. It has customizer with which you can design your own website instantly with the initial previews. The theme is worth a watch for your next project! Evolve is a multi-purpose responsive WordPress theme by Romik84. The theme can be used for creating different kinds of websites including e-commerce, blog, portfolio/personal etc. 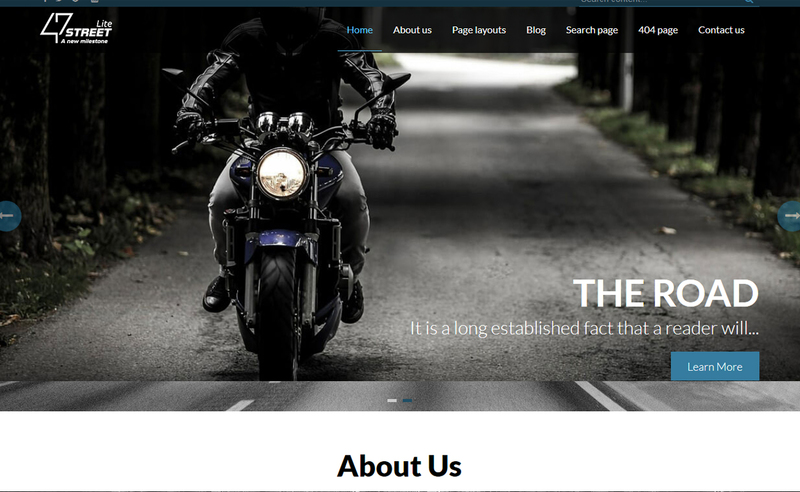 The theme is built with Bootstrap and includes parallax slider with upto 5 slides on any page and a post slider for 10 posts per post category. The the theme customization is very easy from the options. It is user friendly, SEO friendly and gives users access to 500+ Google fonts. The theme is worth a watch for your next project! Sparkling is a clean, minimal and responsive WordPress theme by Silkans. It is a multi-purpose theme, which suits for travel, health, business, finance, portfolio, design, art, photography, personal, creative websites and blogs. The theme comes with full screen slider, social media integration, easy customization and multiple theme layouts. The theme is worth a watch for your next project! 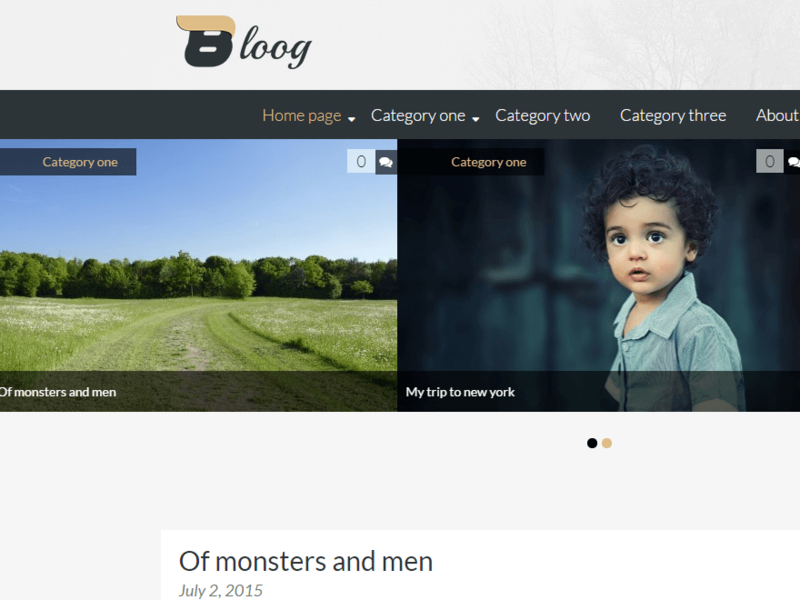 Bloog Lite is a free WordPress blog theme enriched with all features and functionality for a blog site. It has got high image quality and allows you to feature elegant images- that can draw huge traffic to your site. This easy to use theme comes with clean and simple homepage with different layouts to present your content in a well organized way. It is fully based on cool customizer tools and enable live preview of any setting and design that you have changed. 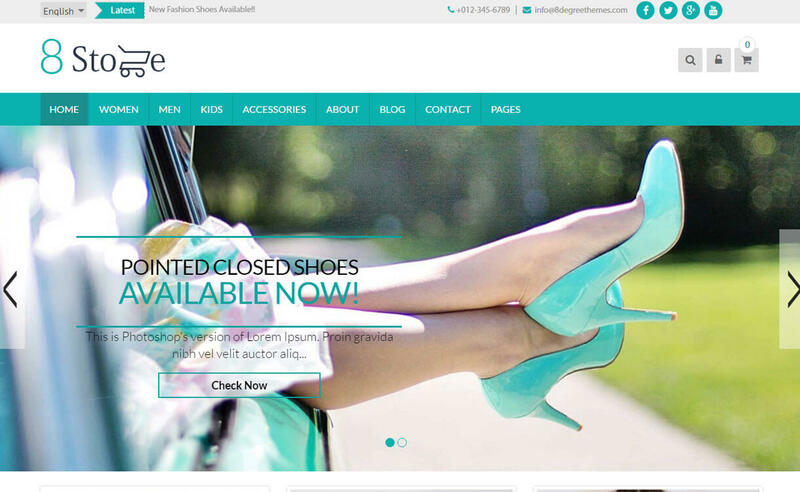 Storefront is a perfect theme for WooCommerce websites by WooThemes. The theme is built up with a deep integration of the leading WooCommerce plugin, which is ideal for the ecommerce websites. It offers multiple layouts, advanced color options, multiple widget regions and extendible codebase making it a joy to customize for the developers. The theme is worth a watch for your next ecommerce project! 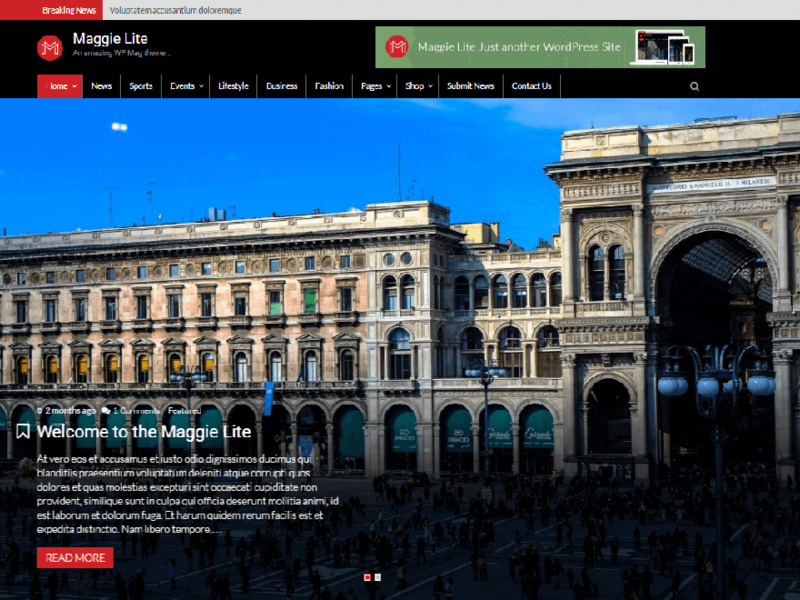 Maggie Lite is an awesome free magazine-style WordPress theme ideal for newspaper, editorial, online magazine, blog or personal websites. It is completely based on cool Customizer tool that is really easy to use. The theme comes with news ticker where you can scroll important news at the top of your homepage. It allows you to add sliders as per your requirement and make your website more delightful. Also, it has 7 widget area where you can add widget of your choice and enhance the functionality of your site. 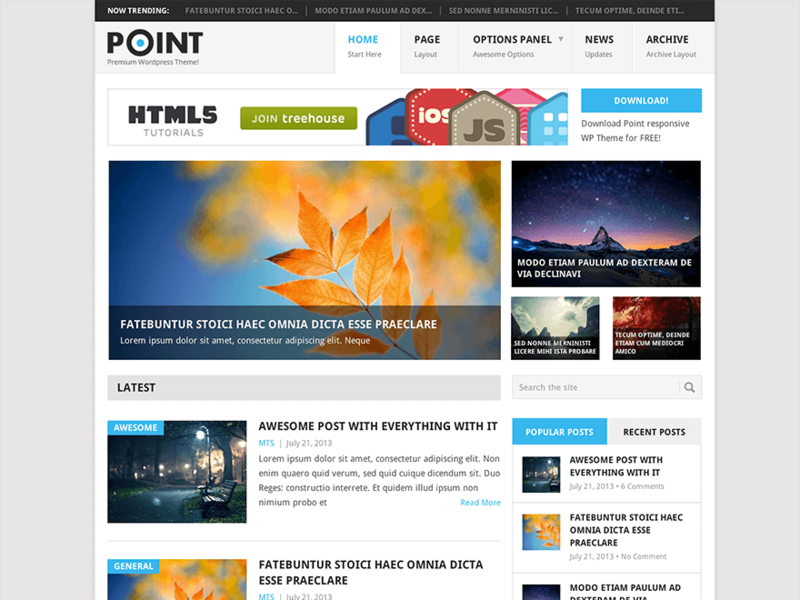 Point is a fluid responsive and multipurpose theme by MyThemeShop. The theme allows you to select from multiple site layouts, backgrounds, color schemes and gives you full freedom to create your kind of website. It is search engine optimized, translation ready, cross browser compatible and RTL language supported. The theme is worth a watch for your next project! 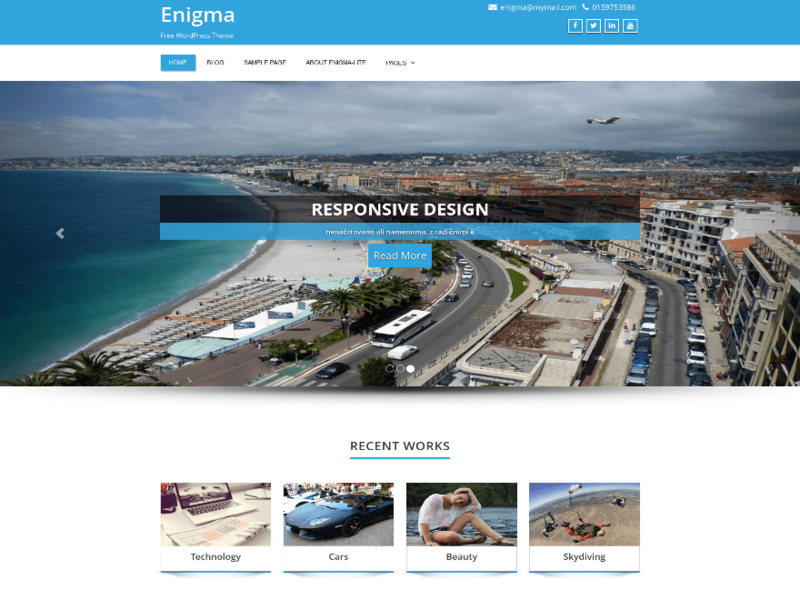 Enigma is a superfine multipurpose responsive theme by weblizar. The theme is ideal for creating business websites due to WooCommerce support however, it is useful for other kinds of websites too, like portfolio, blogging etc. It is retina ready, cross-browser compatible, user-friendly and social network friendly. It has four-page layouts, five widgets available. The theme is worth a lwatch for your next project! Here is another perfect multipurpose theme, Vantage by Greg Priday. It can be used for creating a business site, portfolio or online store. The theme is very powerful with a good integration to powerful plugins like page Builder, Meta slider, WooCommerce etc. The theme is retina ready, which makes the viewers’ experience better than ever. The theme is worth a watch for your next project! 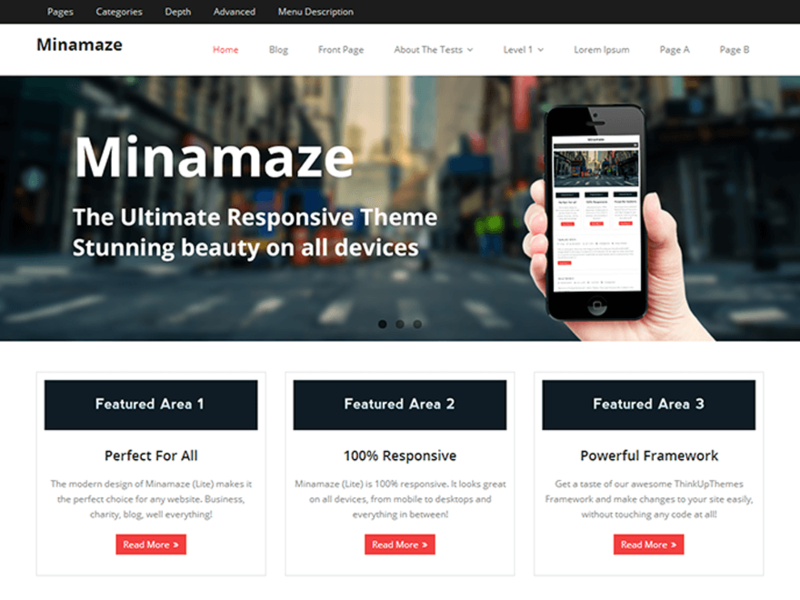 An ideal theme for building business or blog websites is Minamaze created by ThinkUpThemes. It has a very powerful theme options panel, which allows making awesome changes without using any codes. It is HD retina ready and fully responsive. It comes up with a full width easy to use slider and a perfect home page layout enabling you to upload your own logo. It is worth a watch for your next project this year! 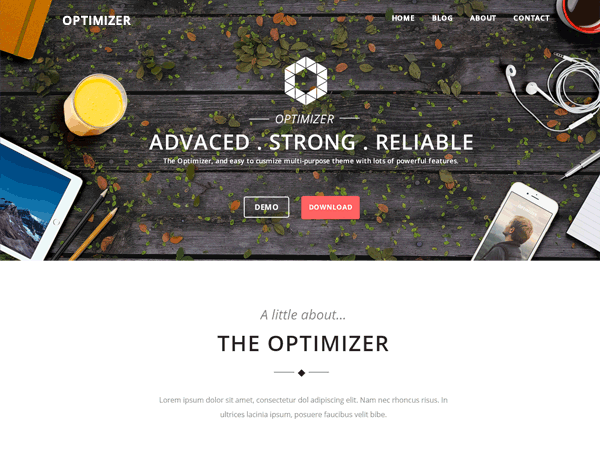 Optimizer is a powerful and multipurpose theme by layerthemes. It’s a perfect theme for landing pages, small business, portfolio, photography, personal and ecommerce websites. It’s very easy to customize each element of the theme without using codes and configure it your way. It allows you access to 600+ Google fonts, custom CSS field and many color options. The theme is worth a watch for your next project this year! 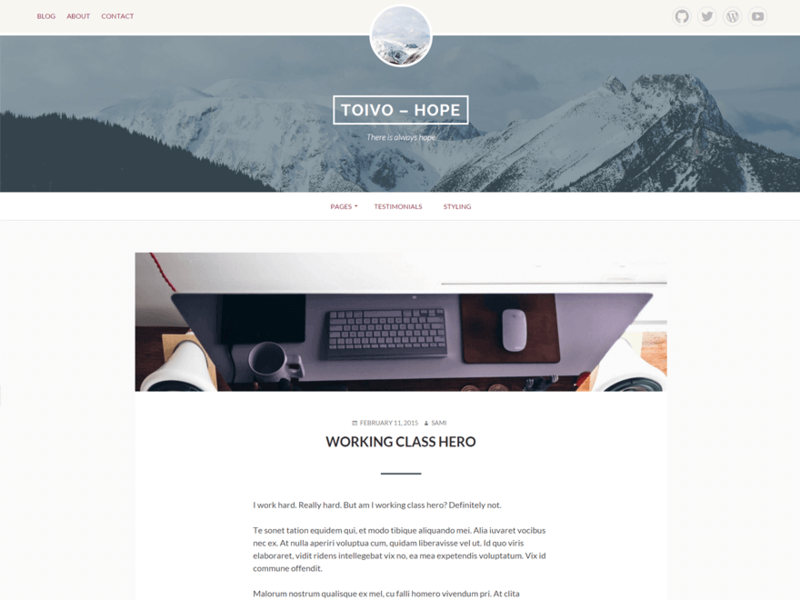 Tempera is a perfect WordPress theme by CryOutCreations. After much research, experiment and hard work, Tempera was built and finally it has become an awesome and powerful theme. The theme can be used for various kinds of websites like small business, corporate, photography, magazine or blogs. It is social networks integrated, translation ready and RTL language supported. The theme ias worth a watch for your next project. 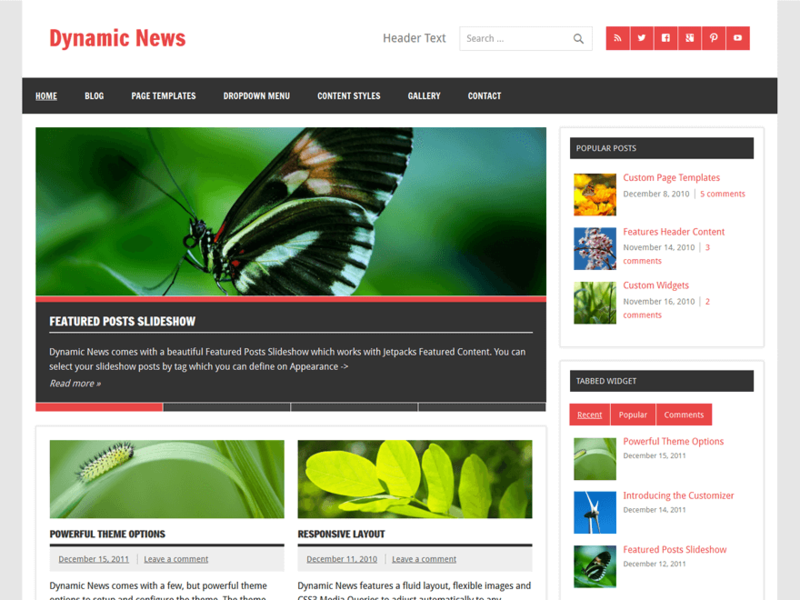 Dynamic News Lite is a multipurpose responsive theme by ThemeZee. It’s especially constructed for building blogging and magazine websites. 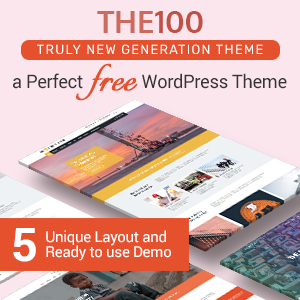 The premium version of the theme is a trending theme in wordpress.com and the number of downloads is god at wordpress,org as well. The theme is worth a watch for your next project! 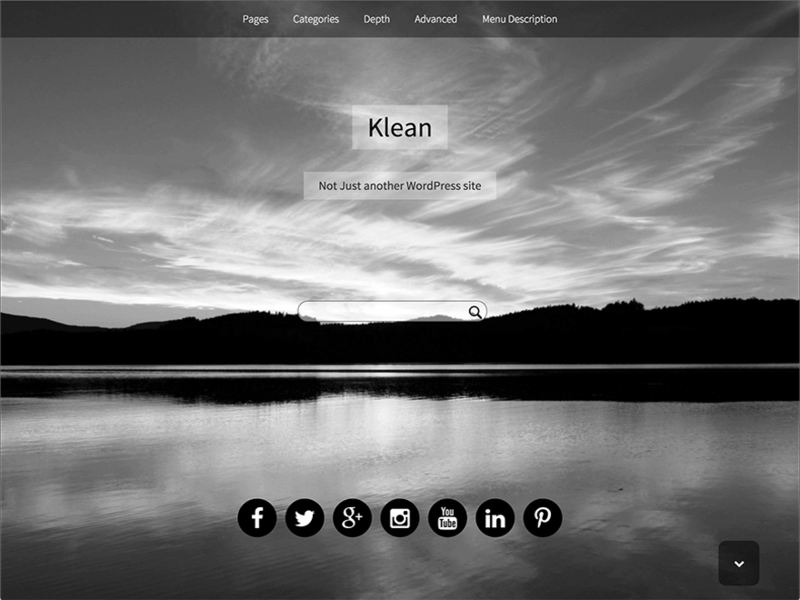 Klean is an attractive and unique WordPress theme by divjotsingh_440. It has all the necessary features of an elegant theme that make your website look beautiful. It allows you to set an attractive full window header and smooth looks of your website. It has used the modern CSS3 heavily. It is worth a watch for your next project! 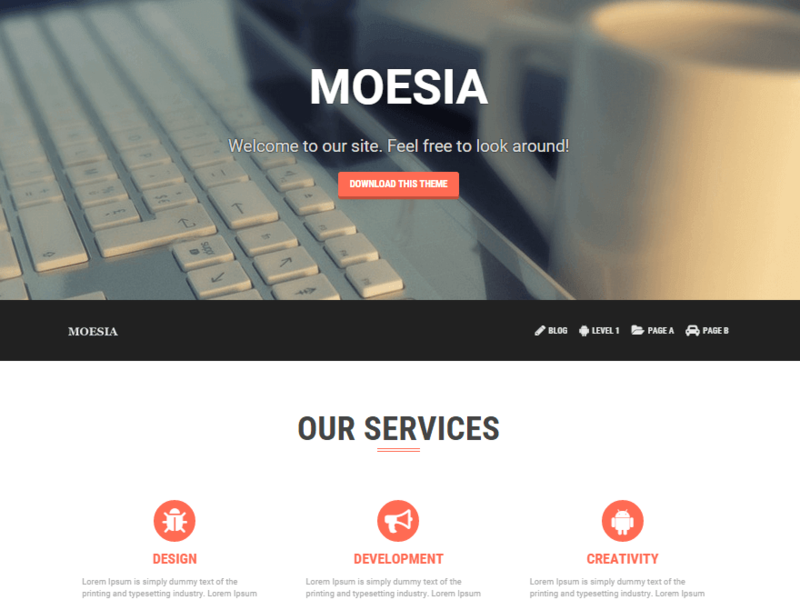 Moesia is a perfect business theme with parallax effect in the home page by athemes. It offers eleven different home page layouts from which you can choose any one that best defines your project. It lets you access to a number of Google fonts, two types of blo layouts, attractive header and cool animation effects. The theme is worth a watch for your nesxt project! The one page theme is trending style in the WordPress community. 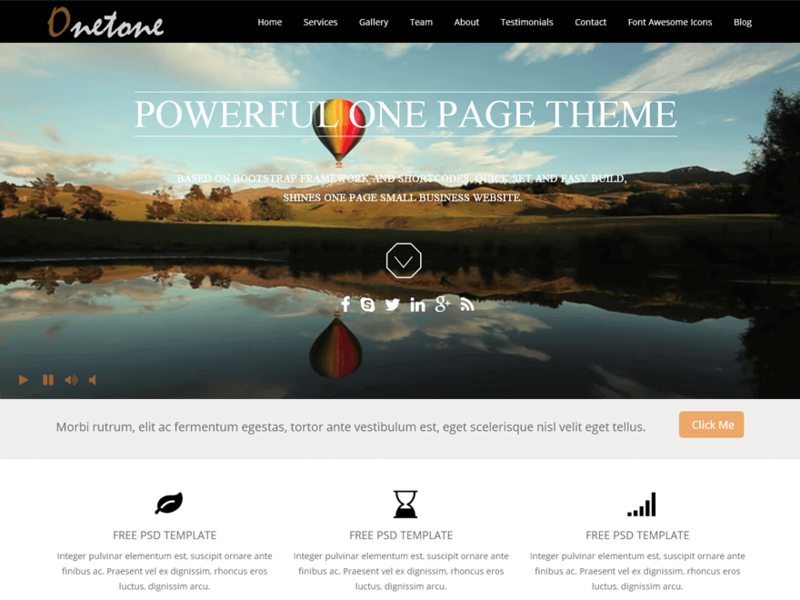 Onetone is a one-page business theme by mageeWP. The theme is designed with the basic sections like Services, About, Gallery, Clients etc whereas more sections can be added from the admin panel easily. The theme is 100% responsive, clean and SEO optimized. The theme is worth a watch for your next project! 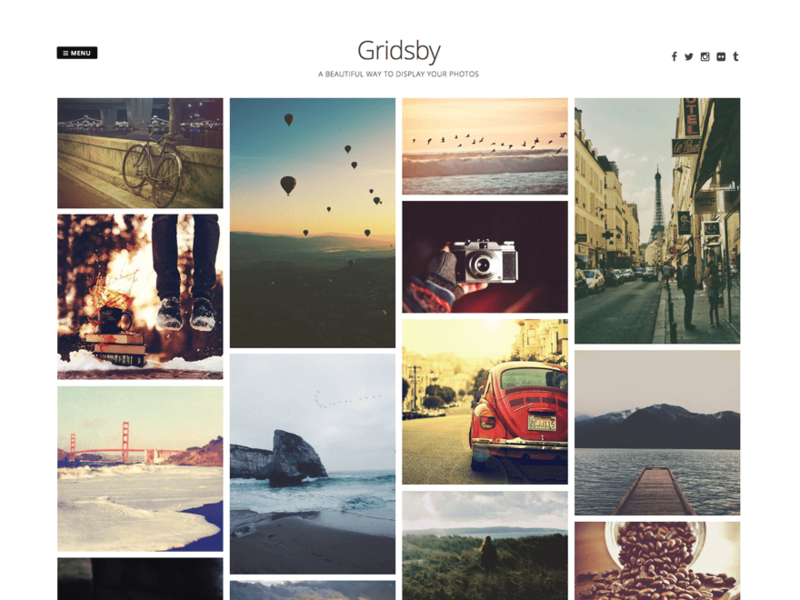 Gridsby is a photo gallery theme by modernthemesnet. It is a unique and beautiful theme which is made for websites in Pinterest style. It is responsive, retina ready and SEO friendly. It can be used for building small business websites, portfolio, news, magazine websites. The theme is worth a watch for your next project! 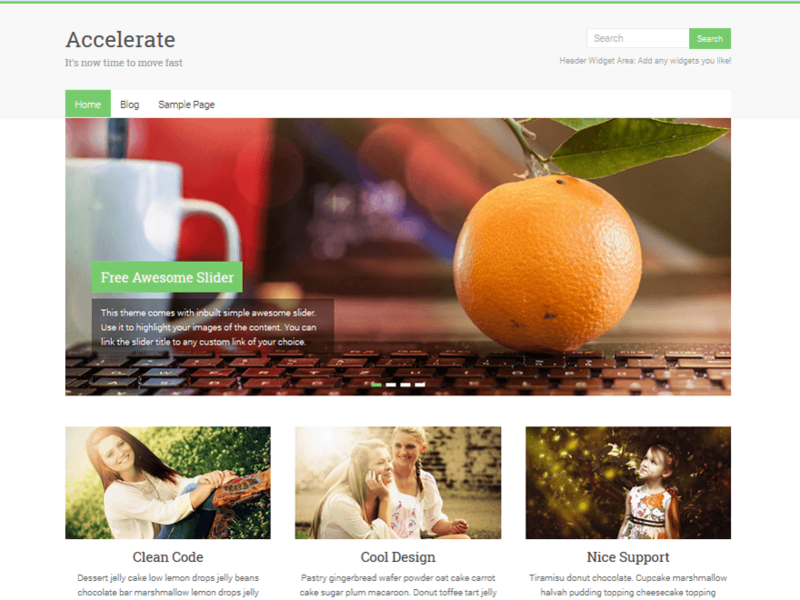 Here is a perfect theme for the bloggers and professionals by Catch Themes. 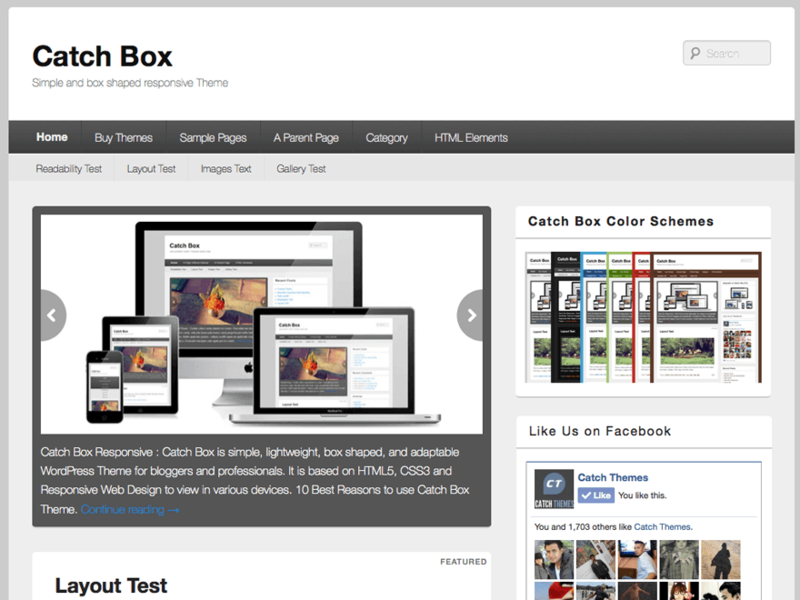 They introduce Catch Box which is a fully responsive, simple and lightweight WordPress theme. It offers multiple color schemes, custom menus, featured sliders etc which lets you customize the theme completely. It is multilingual, cross browser compatible and SEO optimized. The theme is worth a watch for your next project! Accelerate is a multipurpose WordPress theme by ThemeGrill. 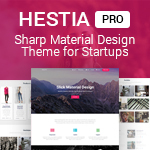 The theme is crafted so beautifully that it is as elegant as a premium theme. It can be used for various purposes such as blog, business, portfolio, travel, corporate etc. It is fully responsive and easy to use theme. The theme is worth a watch for your next project! Dazzling is a clean, modern and minimal WordPress theme by Silkalns. It is WooCommerce supported theme that is suitable for ecommerce websites and online stores however it also can be used for travel, health, personal and photography sites. It is highly customizable and SEO friendly. It is worth a watch for your next project! Sela is a vibrant, bold and clean WordPress theme by automatic. It is a spacious theme with much space for large images, fully responsive and beautifully designed. The theme looks very great with its amazing features. The theme is worth a watch for your next project! 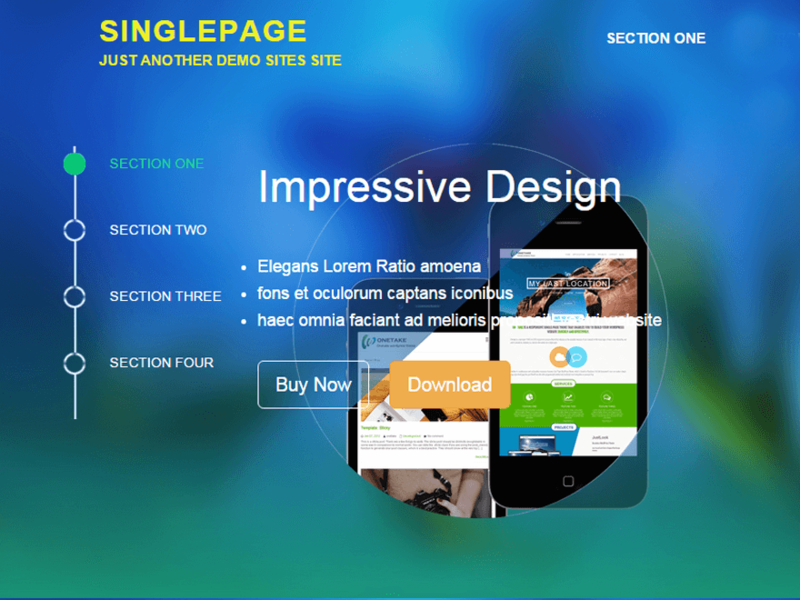 SinglePage is a one page responsive theme by HooThemes. It is built on Twitter Bootstrap framework. It is very flexible theme which can be easily customized in your own style. It has multiple homepage layouts with parallax design and theme options contain a lot of customization options. It’s SEO friendly, user friendly and social media friendly. The theme is worth a watch for your next project! It is a multipurpose responsive WordPress theme by Sami Keijonen. It can be used for business, portfolio, personal or blog websites. It is compatible with the major web browsers, translation ready and SEO optimized. The theme is worth a watch for your next project! Oria is a responsive masonry theme by Vlad. It has unique design with parallax header image, social menu and custom colors. The theme is useful for creating different kinds of websites including photography, nature related, blogging or even business websites. It allows access to multiple Google fonts as well. The theme is worth a watch for your next project! 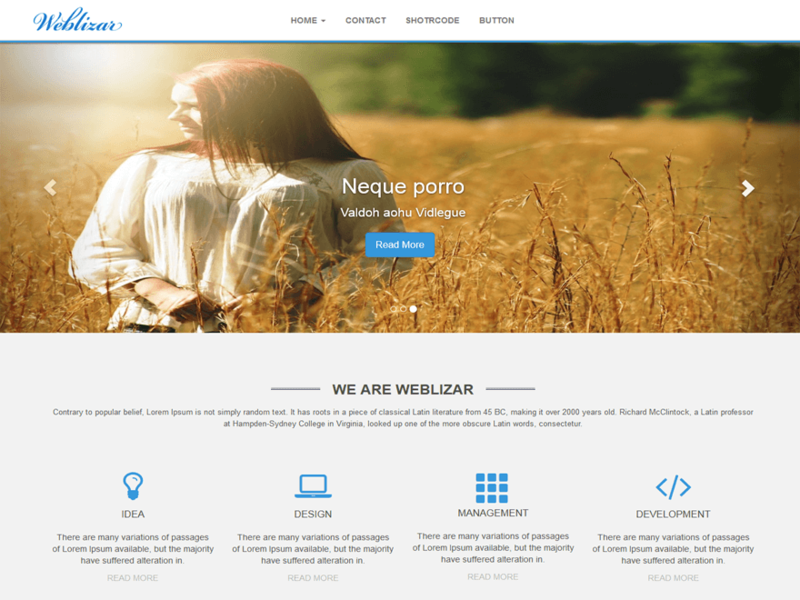 It is a clean and lightweight WordPress theme by weblizar. It is mainly built for business and corporate websites. It is a modern theme which allows to set full screen featured image slideshow. It is very flexible with complete customization options and user friendly. The theme is worth a watch for your next project! 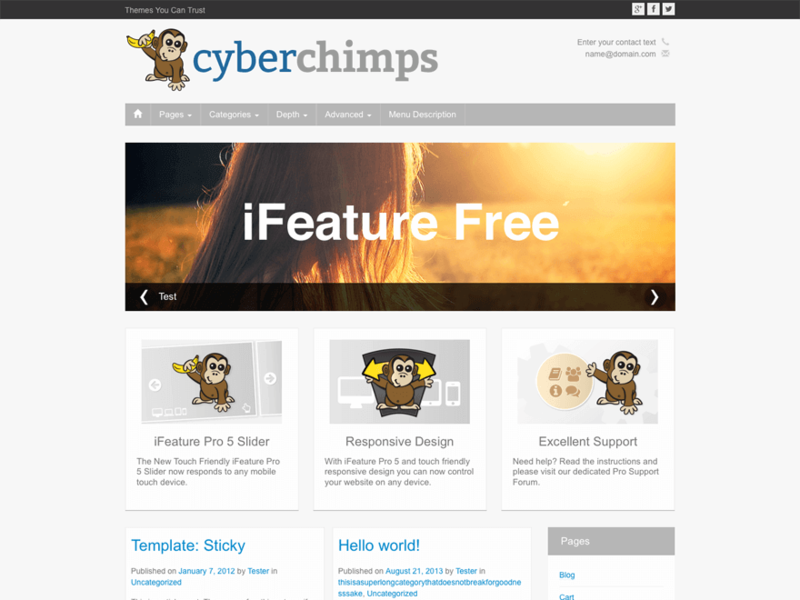 iFeature is a fully responsive and professional theme for WordPress by CyberChimps. It is a multipurpose theme, which can be used for building ecommerce, blogging, personal and portfolio websites. It is constructed with the innovations in the WordPress community like drag-and-drop options and many more. The theme is SEO optimized and social media friendly. It is worth a watch for your next project! TopShop is a perfect WordPress theme for business websites by Kaira. The theme is WooCommerce integrated and has a responsive design for creating the websites for online stores, small businesses etc. It has multiple homepage layouts, header layouts, blog layouts and good social networks integration. It is worth a watch for your next project! Advance is a free multipurpose WordPress specialized for business and general corporate website. It attributes all essential features to make your dream website. With its one click option panel you can change color, layout, setting and any other elements as per your requirement. Since it is a fully responsive theme, it looks good on all screen size and works fluently via any browsers and platform. The theme is SEO optimized to rank your website higher in search engines. It’s visually appealing design and powerful functionality is sure to please you. Even today, people simply look for premium themes as the theme marketers question the reliability of free themes. However, the truth is revealed and can be justified when you observe the awesome usability of these free responsive WordPress themes. Being a large community, WordPress has millions of freaking lovers who spontaneously contribute a lot of free resources like themes back to this community. Hats off to all the free theme authors for being so generous. Hey Buddy!, I found this information for you: "50+ Best Free Responsive WordPress Themes 2019". Here is the website link: https://wpallclub.com/free-responsive-wordpress-themes/. Thank you.